What is the Thornberry Creek Home Owners Association? Our HOA includes over 200 homes consisting of the area accessed by four entrances, Pleasant Valley Drive at FF, Thornberry Creek Drive at Pine Tree Road, Windemer Lane at Trout Creek Road, and Crooked Stick Court at Trout Creek Road. The area originated as Thornberry Creek Estates 1st Addition in 1998, then expanded with TCE 2nd Addition, Barnard Woods, Sedona Addition, Silverthorn Estates and several independent platted parcels. The HOA mission is – “Promote a safe and beautiful place to live with a spirit of community.” As such, our overall focus is continued improvement for the HOA neighborhood. Is membership in the Thornberry Creek Home Owners Association (TCHOA) mandatory? How much does it cost? Membership in the TCHOA is voluntary. Membership dues are $100 and cover the period from July 1st through June 30th. The money is used for landscaping the entrances, community seasonal decor, insurance, and general neighborhood improvements. The TCHOA objective is to promote a sense of community by assisting residents resolve issues, coordinating community information with Village staff, helping maintain standards consistent with the covenants, and organizing social events for neighbor interaction. Checks for membership dues, payable to TCHOA, should be sent to P.O. Box 11274, Green Bay, WI 54307-1274. Some parts of the covenants seem dated. How does the board work with neighbors on the covenants? Our HOA focus for the community is to use the covenants as guidance. The Covenants & Restrictions as indicated are generally the desire we have for our neighborhood. Some things like technology changes, for example satellite dishes are common now, are deviations. We have also modified some guidance, in terms of new construction requirements for masonry and side entry garages, given current architectural trends and the geometry of lots. Preservation of these standards is believed to represent the residents’ best interest and maintain property values. Our HOA works to this end and can only be successful with resident support. What social events happen in the community? Thornberry residents enjoy socializing! Two types of events, TCHOA-sponsored and unsponsored, are held throughout the year. The TCHOA-sponsored events include a children’s end of school year pizza party, an annual resident golf tournament and dinner held in August, an annual Holiday party in December, and the annual home owner’s association meeting in May. Other non-TCHOA-sponsored events include monthly “Pink-Flamingo” home parties during the summer, an annual Packers tailgate party, home cooking demonstrations, and other gatherings. Community women also enjoy monthly morning and evening Bunco games. In addition, the Thornberry Creek at Oneida Golf course offers many leagues during golf season. Residents who want to join the community’s social committee ‘called Sparks’ should send an email to info@thornberrycreekhoa.com. I’m new to Thornberry Creek. How can I get more information on the Village of Hobart? Sign up for the Hobart Headlines at https://www.hobart-wi.org/hobart-headlines and visit the Village website at https://www.hobart-wi.org. When are garbage and recycling collected? Both garbage and recycling are collected every Wednesday throughout the neighborhood. Holidays impact the collection schedule. If any of these holidays fall on a Monday, Tuesday or Wednesday,then Thursday becomes the collection day. Contact the Village of Hobart to obtain garbage bins. Take your bins to the curb after 7pm the evening before or early in the morning on collection day as the trucks arrive in the morning. Who is responsible for maintaining the decorative brick pavers throughout the neighborhood? Homeowners are responsible for maintaining the pavers located in front of their property. How do I report a vehicle speeding through the neighborhood? Resident’s should call the Brown County Dispatch (920-391-7470) with the speeding vehicle’s license plate number and vehicle description. Police will respond. 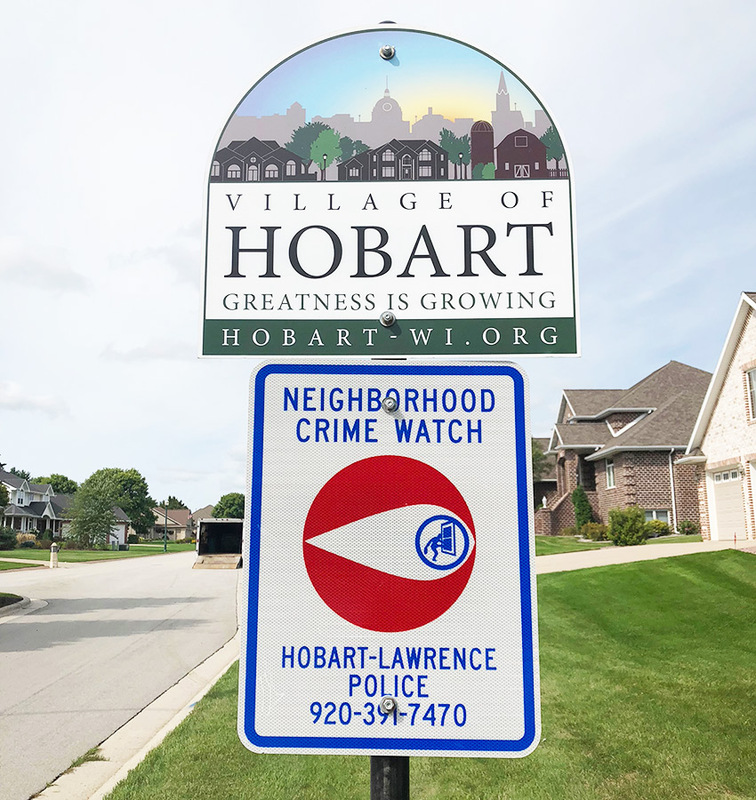 Residents can forward the information (date/time, plate number, description) to Lorie Francar (lorie@hobart-wi.org) for follow-up action if they are unable to call at the time of the incident. How do I report a burned out light pole bulb? Find the pole number located on the pole. There are two ways to report the outage: online at https://accel.wisconsinpublicservice.com/secure/ssl/acct/street_light.aspx or by phone at 1-800-850-7240. How do I get my light box mailbox repaired? Contact Jim Daniels at 920-621-9551.
Who can I contact if my pet is lost and I need help in finding him or her? Members of our community Facebook page can post the information about the pet and other members will read it and respond. If not on Facebook, send an email to info@thornberrycreekhoa.com with the pet’s description and the vicinity the animal was last seen. If you can’t find the pet, contact the Packerland Veterinary Clinic at 920-498-2808, where animal control takes stray animals found in Hobart. See https://www.hobart-wi.org/animal-control for more information.